With this little elixir we encourage you to whisper sweet nothings in your love's ear all month long. Pour ingredients into a pretty pitcher and stir. While you can use any fruit your heart desires. strawberries have their own natural heart shape and beautiful color so they work perfectly here. Makes 2 Servings depending on glass size. Drink up all the antioxidants in this yum-ilcious smoothie. Blend to your desired texture and enjoy! This is the easiest hot idea EVER. Put 10 oz of Blume Vanilla Citrus in a pan, add 4 tsp fresh Lemon Juice. Heat to simmer or steaming. Pour in a cup. Add 1 oz of Bulleit Bourbon to each cup and stir with a Cinnamon Stick. You can use lemon, orange wedges, cinnamon stick or star anise. To make: Put 3-4 Tbsp chilled Blume Wild Blueberry reduction into a champagne glass. Gently pour white or pink champagne (prosecco is fine too) into a tilted glass to keep the reduction layer at the bottom undisturbed. To make the reduction: Simmer 10 oz. Blume Wild Blueberry in a pan until it is reduced down to approx. 1/4 of the water content. Add 1 Tbsp of honey to the gently cooled reduction. Refrigerate until ready to use. You can make up to two days ahead. Each bottle yields about 4-5 Tbsps of the reduction. Who doesn’t love cranberries and their rich jewel tones at Thanksgiving? 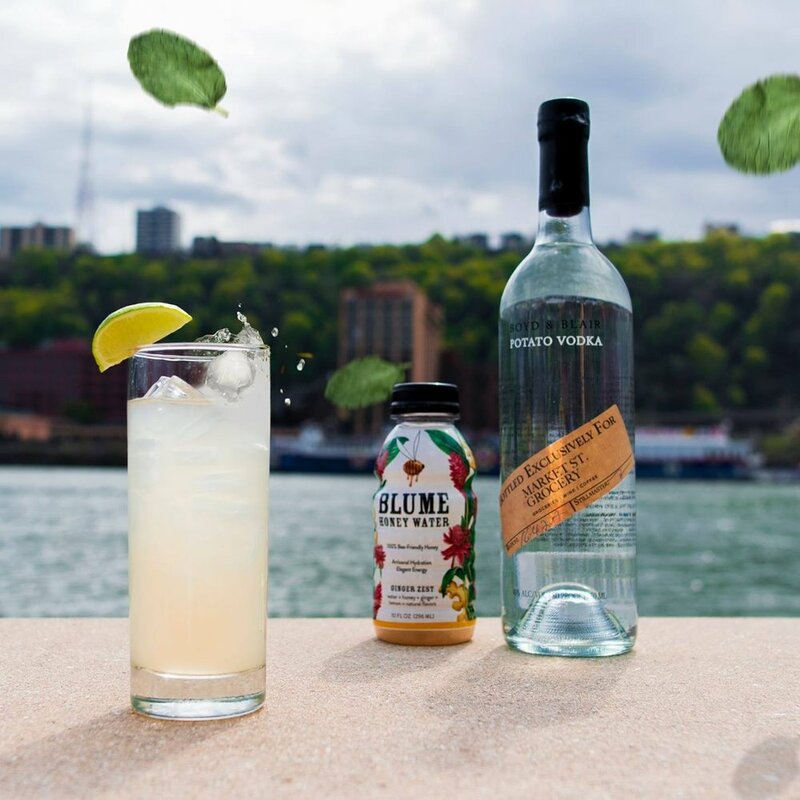 After one sip of this healthy cocktail, it could become your next holiday classic! Pour all chilled ingredients into a cocktail shaker and serve very cold. 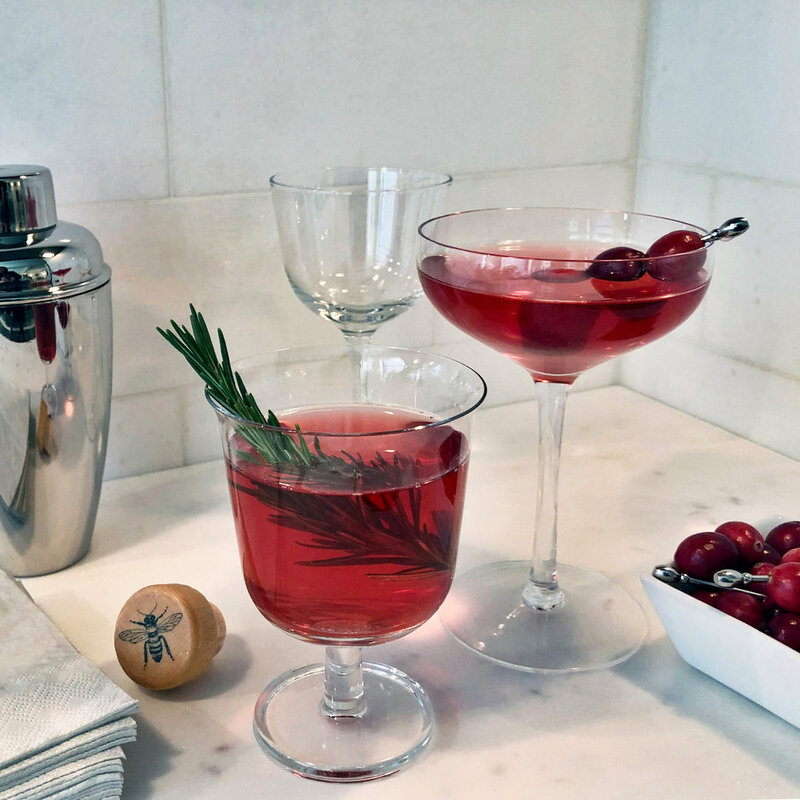 Garnish with cranberries or a sprig of rosemary. Makes 2-3 servings depending on the glass size. This is the perfect Halloween Party conversation starter. To start the chatter see Blume Bee Secrets #32. Pour all chilled ingredients into a cocktail shaker and mix. Divide liquid into 2 martini glasses. Place Eyeball Garnish in glasses. Eyeball Garnish: Use canned lychees for the eyeball and place fresh blueberries or cranberries in the pit cavity for the pupil. Shake Wild Blueberry Blume, Tequila,Cointreau in a chilled cocktail shaker. Mix 2/3 Granulated Honey with 1/3 Margarita salt. Spread on a flat or slightly curved surface. Wipe a lime slice around the glass and turn glass upside-down into the mixture. Twist to coat the rim. Pour Blume Blueberry Margarita mixture into the dressed glass and garnish with lime slice. Serve very cold. Makes 1 serving. Find your favorite popsicle mold and easily make your own Blume-sicles this summer! Try all three of our transporting flavors, Vanilla Citrus, Wild Blueberry and Ginger Zest. Your gang will be refreshed all summer while delivering our signature elegant energy and healthy hydration with every bite. You can have fun with these frozen treats by adding fruits and spices for an extra flavor burst! Here, we've complimented our flavors with fresh blueberries, small orange and lemon zest and candied ginger. Stay cool and let us know what y'all come up with! Try this delightful summer refresher on the beach or at your next backyard gathering. You will get raves! -Garnish with your favorite edible flower. A twist of meyer lemon zest over the glass just before serving is optional. Mix Blume Vanilla Citrus, gin, and aromatic bitter in a small shaker. Pour into a low-ball glass with a single ice sphere. Flame an orange peel for that smoky beekeeper effect, and wipe the glass rim with the peel. Makes 3-4 depending on glass size. Bee-ware, they go down smoothly! Yields approx 2 cups Garnish with mint or basil and ENJOY! Whether gathering friends 'round the tree or ringing in the New Year, this lovely libation celebrates that we #liveinfullblume together. The edible hybiscus flower is the dressy piece-de-resistance! To make: Use 1/3 Vanilla Citrus Blume Honey Water (very chilled) to 2/3 Rose Prosecco, and drop in an edible hybiscus flower. Hybiscus flowers are available in stores around the U.S. or special order from The Wild Flower Hybiscus Co.